Are you just starting to look at this whole “ketogenic diet” thing? You might be wondering what foods you can eat on the keto diet. There's a lot of talk about what foods to avoid on the keto diet. So, I put together a little keto food list (ok, it's not so little). Thankfully, it's pretty easy to know what keto diet foods are good and which are bad. The ketogenic diet is a diet where you eat meals that are high fat, moderate protein amounts and then low carb amounts (under 30g net carbs mostly). Right there it's easy to see that you need to keep your carb count low. But, how do you do that, right? 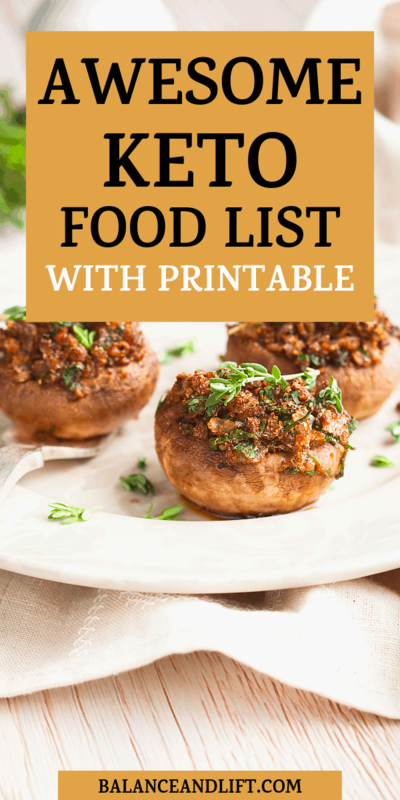 Get Started on the Right Foot with This Keto Food List! I know when I first started my journey on the keto diet I felt really restricted. But, I was focusing on all of the foods I couldn't eat rather than on everything that I could eat. There are a lot of foods you can eat. You just need to know what to avoid and what is ok. Once you have an idea of what keto diet foods you can eat it will be so much easier. Knowing the foods you can and can't eat allow you to create meal plans. You're able to prep meals ahead of time so you won't fall off the wagon. And, you'll start enjoying your foods more. The best part, I think, is that there are many “sweet” treats you can have on the keto diet. Check out these keto sweets here. Unlike the low carb diet, the keto diet decreases the number of carbs you eat but increases the amount of fat you eat. So, your keto diet will be 75% from fat, 20% from protein and 5% from carbs. This isn't a hard and fast rule, but that's the general breakdown of the keto diet ratios. There are different types of the ketogenic diet, but I want to keep it simple for this post. I'll go into more detail later about the different keto styles. Our bodies are used to running on glucose. Glucose comes from carbohydrates that we eat. But, when you cut your carbs really low like cutting your carb intake as low as 20g net carbs (per the ketogenic diet) it forces your body to seek fuel another way. This is why it's important to up your fat intake. Your body will start using fat as a fuel source and converting it to ketones. Our body performs surprisingly well on ketones and you start to feel amazing. Check out how to start a ketogenic diet here. You have to get past the keto flu symptoms, but they typically only last a week if you're doing everything you can to combat it. Once you've passed the keto flu you're in the homestretch and your body is starting to use ketones for fuel rather than carbs! It might seem a little limiting when you think about all the things you can't eat, but it's really not that limiting. You're avoiding heavy carb items, but that still leaves a plethora amount of other foods out there for you to enjoy. 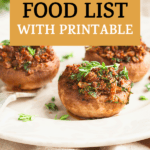 It's not an exhaustive list, but it is a keto food list of common items people have a hard time letting go of in the beginning. As you fuel your body with the proper keto diet foods you'll start to lose your cravings. As time goes by, you'll also notice you feel bad if you eat any of these things. Here are some of the things you'll want to stay away from. Now we're on to the good stuff! What to eat on a keto diet? You can actually eat a good bit of delicious foods. In the beginning, I wouldn't force yourself to any high standards. A lot of folks will tell you not to eat dairy, no processed meats, no this or that. And, while that is totally something that works, you want to make sure you're not limiting yourself in the beginning. Cheese, for instance, is something I've learned a little too heavy on in the beginning, but as you get a handle on how this whole keto diet thing works you'll start backing off. It's kind of natural, I've found. Speaking with others, I've learned that they ate cheese heavily in the beginning as well and then it tapered off as they started making meals that were high in fat. Don't put too much pressure on yourself to be perfect. Eat high fat, moderate protein, and low carbs and you'll be in a state of ketosis before you know it. To make it easy on yourself you can track your ketone levels with this monitor. Here's a list of common keto diet foods. Again, this isn't an exhaustive list by any means. There are many herbs, spices, condiments, and other items that should be researched. But, this list of keto diet foods will get you started. For best results always check labels. There are hidden carbs in a lot of the foods you can buy at stores now. This supplement is great for keto beginners and people who have been keto for a while. By adding Exogenous Ketones to your meal plan it will help you get back into ketosis faster and provide your body with ketones (for energy). When you're just starting a ketogenic diet, these are great to have on hand because they will help you get into ketosis a lot faster because you're providing your body with ketones. When you give your body ketones while simultaneously cutting your carb intake it helps your body realize the fuel source it needs to use. Basically, Exogenous Ketones helps you get into ketosis and stay there. I didn't realize just how much this came into play until I started having headaches and had keto flu symptoms… even after 4 weeks of eating a keto diet. Knowing what to eat on a keto diet doesn't always help when you're not replacing the electrolytes you're losing. Adding Potassium Chloride to your water or a DIY Electrolyte drink (as discussed below) will greatly help you beat the keto flu. I personally use Natural Calm right now. But, I'm always on the lookout for a better supplement. Natural Calm Magnesium is great for helping to relieve stress and help you sleep better at night. You can take 1-2 teaspoons in a glass of hot water and slowly sip in the evening before bed or you can make yourself a DIY Electrolyte drink. Add Calm, the juice of a lemon and some salt into a glass of water. Instant DIY Electrolyte drink. Now that you have a rough idea of what to eat on a keto diet and what to avoid you can start making your meal plans. Meal planning is a great way to eliminate any confusion, overwhelm and keep you from falling into any food traps. When you plan your meals you know what you're eating and won't falter and eat things you're not supposed to eat. A great way to find replacements for things you crave is to search on Pinterest. Pinterest has millions of recipes that are keto friendly and you can almost find anything you're craving that's allowed on the keto diet.